Having survived a sword fight with the Mighty Masked Swordsman of Mongo (who turns out to be Prince Baron, the rightful ruler of the planet and admirer of Princess Aura), Flash finds himself battling an un-killable orangopoid. Let’s see how Flash gets himself out of this mess in Chapter 9 of the Flash Gordon Rewatch – Fighting the Fire Dragon. Hold on a minute! There wasn’t any talk of ancient legends last week! The High Priest tells Princess Aura about a spear that will apparently kill the orangopoid – presumably because he fancies her too. Aura grabs the spear, gives it Flash, and he does indeed use it to kill the creature. Outraged, Ming makes the High Priest responsible for finding the traitor who told Aura about the spear. The traitor’s punishment will be death. Uh, oh. 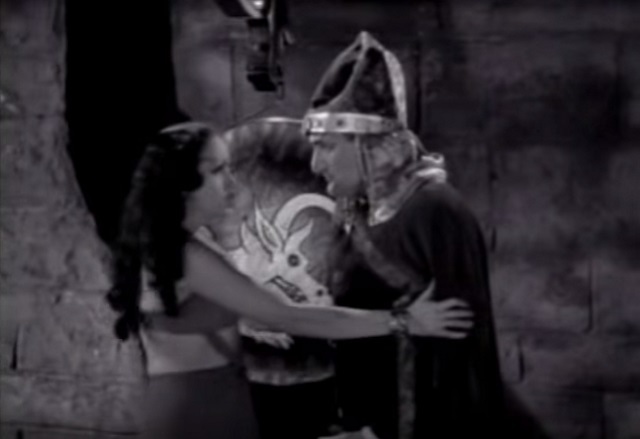 To Dale’s delight, Vultan demands that Flash and the others be declared free and given the right to choose their brides. Ming stalls and, claiming the battlefield is no place for a party, declares they will be given their freedom (and their wives) in three days. Ming heads back to his palace, and Flash wishes a fond farewell to Prince Thun. As you might expect, once they are back at Ming’s palace he begins plotting his latest treachery. Dale is clearly the smartest of the bunch as she’s the only one who even considers Ming might be up to something. While Ming is planning his revenge, Zarkov works on establishing communication with Flash’s dad on Earth. Ming instructs the High Priest to have Flash “removed”, or else. Flash comforts Dale (who is still the only one convinced Ming is up to no good – what part of Ming the Merciless don’t these people understand?) and the two fall into each others arms. Unbeknownst to Flash and Dale, Princess Aura sees them kissing and jealousy rears its ugly head once more. Flash, who has clearly not be paying attention, promises Dale that everything’s going to be all right. The High Priest catches the Princess spying on Flash but the High Priest is a tricksy devil and proposes a plan whereby Princess Aura convinces Flash to go with her to the Temple of Tayo where the two of them can live in happiness. Getting to the temple involves passing through the Tunnel of Terror (see Chapter 2) and past the fire beast. But the mystic hour of midnight is nap time for the fire monster and nothing but the sacred gong would be able to rouse him. Aura points out the Flash clearly has the hots for Dale rather than her, but the High Priest has the solution to that problem, too. He gives Dale a couple of tablets. One to knock Flash out and the other to make him to forget everything. When he wakes up, Aura will be the first woman he sees. Being a good old red blooded male, he’ll fall in love with Aura and the past will not stand between them. While Zarkov continues to try to contact Earth, Aura has two glasses of drugged wine delivered to Flash and Baron. Once they’re unconscious, Aura has some of Ming’s guards carry Flash off on a coffee table. Zarkov makes contact with Earth and rushes to inform Flash but instead discovers the unconscious Baron. Vultan arrives and thanks to his mad detective skills, they deduce that Aura is behind Flash’s disappearance. Baron is still hopeful that the woman he loves is not a devious little minx but they catch the traitorous guard that brought Flash the wine counting his blood money and he confesses that it was indeed Aura that paid him to drug Flash and that she plans to take him through the Tunnel of Terror. Aura gives Flash the drug that will make him forget everything and sets off into the Tunnel to escape Baron and the others who are rapidly approaching. 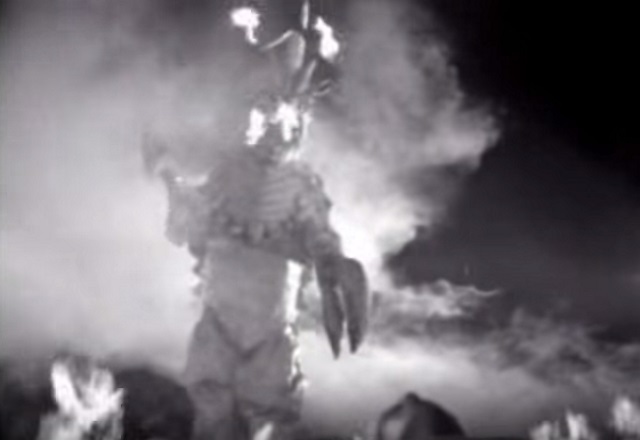 It turns out that Ming’s High Priest is just as devious as Ming’s daughter, and he rings the gong that awakens the fire beast (which looks a lot like the giant crab-parrot-Godzilla thing from Chapter 2 but with added fire and some sort of curved horn thing). Zarkov, Baron, Vultan and Dale arrive just as the fire beast approaches the unconscious Flash. Will they be able to save Flash from the monstrous beast? Will the High Priest get his comeuppance? I must admit I’m a sucker for a well written traitor – a lot of my favourite films feature last minute reversals where a character you thought was good turns out not to be. I only remember one scene from John Carpenter’s They Live and it’s a betrayal I just didn’t see coming at the time. It’s hard to pull that kind of twist off when you’re making something for a modern audience, particularly adults. I read about a survey where they asked Harry Potter fans whether they thought Snape was good or bad. This was before the final books were out and pretty consistently the kids all labelled him as the bad guy – those black clothes are a dead giveaway. But the adults weren’t as convinced. Adults see the world as shades of grey and they tended to suspect that all was not what it seemed when it came to Snape. 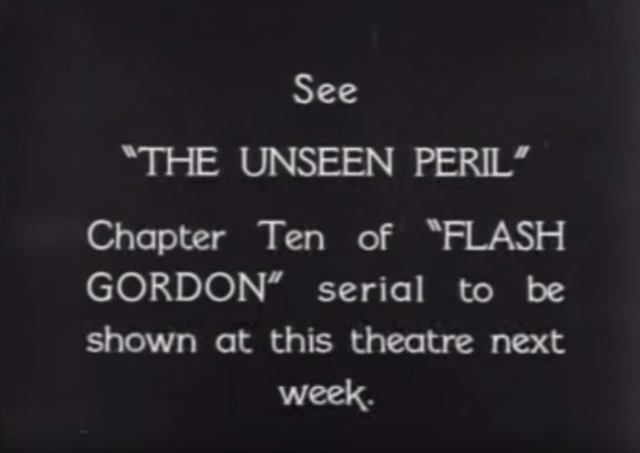 Of course, Flash Gordon doesn’t handle it as deftly, I doubt there are many people who wouldn’t see the High Priest’s actions coming a mile off. And we have a bonus scene with Aura, the High Priest and what looks suspiciously like a microphone boom. I’m going to go with the High Priest again – the rascal. 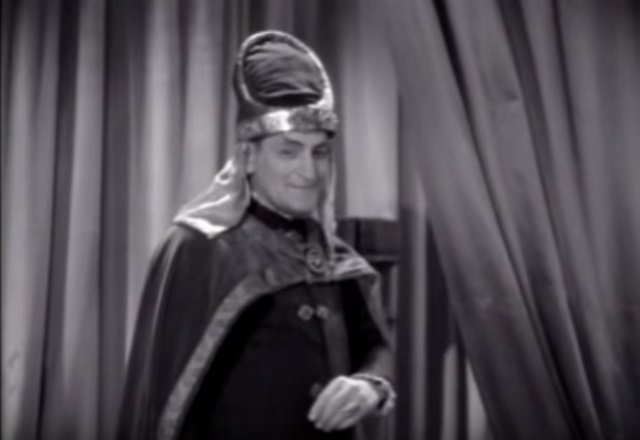 Fun Fact: Lon Poff played the role of the High Priest in the first few chapters but sadly died during production. Theodore Lorch took over to finish the rest of the serial so technically the favourite character award is going to someone new. Flash Gordon’s adventures continue next week with Chapter 10 – The Unseen Peril. 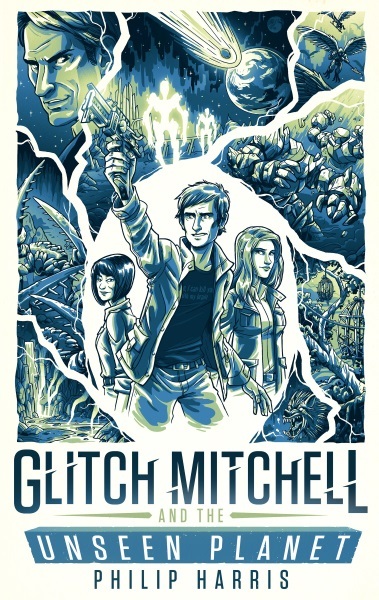 There’s only 3 days until my homage to the Flash Gordon serials, Glitch Mitchell and the Unseen Planet, is released. It will be available on Nook, Kobo, iBooks and of course Amazon Kindle on 25th August with a print edition following soon after. The cliffhanger ending here is an excellent one. Also, we might ask ourselves as to who is more devious, the High Priest or Princess Aura?